Drink Art is a regular feature of Lyke2Drink that looks at famous works of art depicting men and women enjoying life and drink. Vincent van Gogh is recognized for his brooding post-Impressionist paintings and for having sliced off the lobe of one of his ears. Before becoming an artist he was a salesman, a clerk in a bookstore and a preacher. Seeing his works in the great galleries of the world makes it even more amazing that he sold only one painting during his life. Troubled by mental health issues and abuse of absinthe, van Gogh committed suicide. He clearly believed that alcohol was a social and artistic catalyst. Van Gogh spent time in Paris and often used what he saw as foder for paintings. 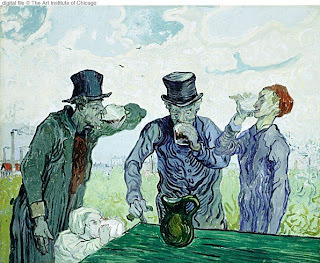 In The Drinkers, van Gogh is actually copying a woodblock print by Honore Daumier titled "Physiology of the Drinker, The Four Ages." The painting depicts a youth and three men gathered around a table, tankards in hand, with a pitcher at the ready for refills. In the painting, which he did during the last year of his life, van Gogh moves away from the glamorous settings used by many Paris cafe artists that depicted the well to do enjoying life. The painting is among the 300,000 works on display at the Art Institute of Chicago.